Lightweight rower Ruth Walczak has won two World Championships medals during the Rio 2016 Olympiad. Ruth Walczak is a qualified designer who first represented the GB Rowing Team in 2005 during a highly-successful junior career and also made four appearances at the World U23 Championships. Ruth finished 2015 on a high by winning lightweight women’s quadruple scull silver at the World Championships in Aiguebelette with Ellie Piggott, Brianna Stubbs and Emily Craig. The same quartet had won gold at the Holland Beker regatta earlier in the season, with Ruth and Emily also bagging silver in the lightweight double. 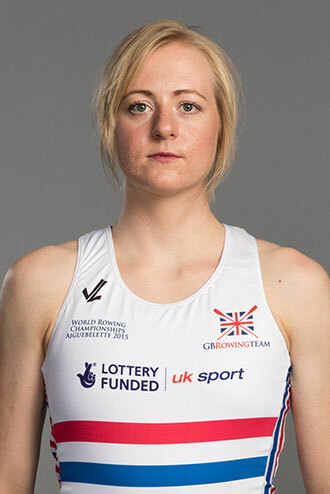 After finishing second at the GB Rowing Team Senior Trials, Ruth raced in the lightweight single throughout 2013 and was just outside the medals at all three World Cup regattas. She finally earned a deserved podium place at the World Championships in Chungju, winning bronze. She improved to silver at the following year’s Aiguebelette World Cup before finishing the season in the lightweight quad with Ellie, Brianna and Charlotte Taylor. They finished eighth in the open-weight category at the World Cup in Lucerne and sixth at the World Championships in Amsterdam. Ruth made her third appearance at the World U23 Championships in 2009, finishing fifth in the women’s four. She was then eighth with the quad at the following year’s event in Brest. On her GB senior debut at the 2012 European Championships in Varese, Ruth and Imogen Walsh won bronze in the lightweight women’s double after just being edged out of second place following a good battle with an experienced pairing from Greece. Ruth enjoyed great success as a junior and twice represented GB at the Coupe de la Jeunesse, winning gold in the women’s single in 2005 and in the women’s double in 2006. She also claimed a hat-trick of National Schools Regatta title between 2005 and 2007, with two successes in the single coming either side of a double win in 2006. Ruth first competed at the World U23 Championships in Glasgow in 2007, finishing fifth in the single. She was then fourth in the double at the 2008 event in Brandenburg. Ruth graduated with a 1st Class Honours degree in Product Design from Central Saint Martins College of Art & Design. When not training she puts her degree to good use by working as an intern at 1HQ, a design business based in Windsor. In her spare time Ruth enjoys cooking and ‘upcycling’ second hand furniture. Ruth is Lottery Funded through UK Sport.